AND so it emerges this week that Star Wars may have been stopped from returning to film on Scellig Mhichíl because of potential damage to nature on the Kerry island. It seems the storm petrels that breed there have faced down one of the world’s biggest corporations. Who would have thought that the force would be with such a small, inconspicuous bird? Not many people have seen a storm petrel – considering it’s the size of a sparrow and spends its life at sea that’s not so surprising – but, incredibly, Belfast can boast its own band of experts. Bog Meadows campaigner Aidan Crean, along with pals Geordie Hynes and Terry Goldsmith, have had thousands – yes thousands – of the nocturnal birds in their hands. And this is a bird that won’t feed within miles of any land mass, which eats plankton and which is normally only seen by trawlermen on deep sea expeditions. So how did Aidan and his mates manage to get their hands on them? They travel year after year to deserted islands off the west coast of Ireland, camp for up to a week in isolation there and trap as many storm petrels as they can. Each is weighed and ringed before being released, providing vital information on one of our least known and most fascinating birds. They’ve been to Inismurray and Duvilaun Mór off Sligo and Rathlin O’Birne off Donegal, arriving by curragh or small boat and being abandoned there, often without even phone contact with the mainland. “We bring enough food and water for a week even if we only stay for five days,” says Geordie. “We often pitch our tents beside the old buildings – on Inismurray there’s a stone beehive hut that more than a 1,000 years old, and there’s even old bowls and stuff that people used to use inside it. “The petrels sweep in at night and nest under the stones of the buildings. Geordie said the petrel is his “second favourite bird” – his favourite is perhaps surprisingly humble: the blackbird. “Storm petrels are so friendly – they are small but strong with flexible wings that can help them fly through storms and through waves. It never sees people so it will often just rest on your hand. “It looks like a moth and makes a call that sounds what you’d imagine a fairy to sound like. We’ve caught many with just one leg – they walk on the water by hovering and fish often bite off one of their legs. 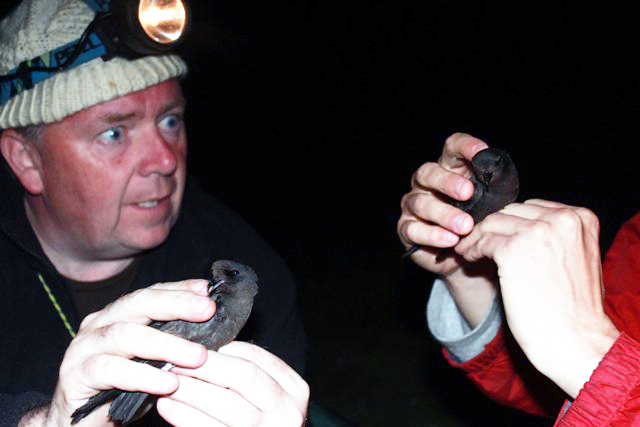 The birds ringed by the West Belfast lads have been vital in helping protect the storm petrel, gearr róid in Irish. When ringed birds are re-caught, we can learn about their behaviour. Geordie and Aidan actually caught one of their ringed birds while on holiday (a busman’s holiday, of course) in Portugal. Storm petrels like uninhabited islands not really because there are no people there, but because animals associated with us, like rats and cats, would easily destroy their nest with its single, precious egg. Recently, rather than travel all the way to the west coast, the boys have been travelling to Sheep Island near Ardglass, where they blast out the petrel’s call on loudspeakers at night, which attracts the birds to the land where they can be caught and ringed. “These petrels are circumnavigating Ireland all the time, but we never see them,” says Geordie. All in all, it’s a bird that is worthy of the Jedi name.